A watched pot might never boil, but if you blink, you’ll miss Heatworks new Duo carafe working its magic. Using the company’s proprietary heating technology, the carafe promises to instantly heat cold water to any temperature while it’s being poured, drastically reducing the amount of energy it uses, and all but eliminating the wait for a piping hot cup of tea. Heatworks’ Ohmic Array Technology works similar to how a microwave heats food. Instead of heating water by first super-heating a submerged metal element that transfers heat energy, the technology uses graphite electrodes to pass electricity directly through H2O, exciting the minerals in the water which in turn instantly increase the liquid’s temperature. The system relies on sophisticated electronics to ensure the water doesn’t get any hotter than a pre-set temperature and to eliminate the risk of leaked current causing unpleasant shocks to users. But it’s a big improvement to how water heaters have inefficiently worked for decades. The technology almost sounds like it borders on science fiction, but Heatworks already sells an $800 (£627) on-demand home water heater that relies on the technique, and at last year’s CES, it introduced a countertop dishwasher called the Tetra that doesn’t require any plumbing connections for hot water. At this year’s CES, Heatworks is announcing that pre-orders for the $299 (UK price TBC) Tetra will start sometime in early 2019, but also revealed another new home product that uses the Ohmic Array Technology to further improve life in the kitchen. 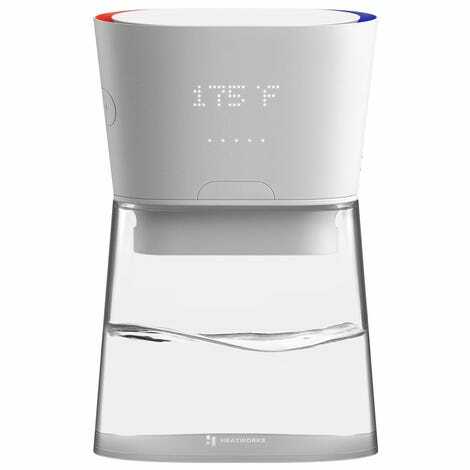 The battery-powered Duo Carafe features Heatworks’ unique heating technology built right into its lid. It can be stored in the fridge like a Brita pitcher, providing filtered cold water as needed. But when you want coffee, tea, or even instant noodles, the Duo can instantly dispense boiling water instead, heated to within a single degree of a specified temperature.